Filing An SSDI Claim? I Can Help. 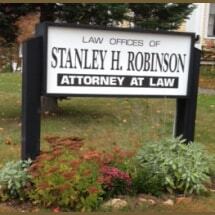 At the law offices of Stanley H. Robinson in Franklin, New Hampshire, I am dedicated to helping you find the best outcome in your case. I have been practicing in the Lakes Region since 1980. I understand the complex nature of filing for Social Security Disability benefits, and have helped many clients through this complicated process. I can help you, too. At my law firm, you will receive personalized attention from an attorney who truly cares about your future. It is important to work with an experienced lawyer who knows what to expect in your case and what steps to take along the way. I will guide you through this process and will always be upfront and honest about your SSDI claim. If you are filing an initial SSDI claim or appealing a denied claim, I can help. I know the challenges you face when living with a disability. I will work aggressively to help you get the benefits you deserve. At the law offices of Stanley H. Robinson, you will get the attention you deserve along with efficient and skilled legal services from an attorney who is committed to helping you.